Two public broadcast stations are digging into the private life of Rancho Santa Fe’s John Cox, the Republican candidate for governor. KQED of San Francisco and KPCC of Pasadena cite divorce records in alleging that Cox bought a home for a Massachusetts girlfriend and her family while he was married to Nancy Cox and living in Illinois. Nancy Cox, in 1997 court filings, also said that John wanted to stay married with the “understanding he would continue to maintain a relationship with the other woman in Massachusetts,” said the report by Annie Gilbertson for KPCC/LAist and John Sepulvado for KQED and the California Report. In his governor campaign, Cox has rarely referenced a well-documented extramarital affair by Lt. Gov. Gavin Newsom, the Democratic front-runner, according to a Cox spokesman. The spokesman said Cox addressed the Newsom affair only when asked about it in forum settings. In February, the Sacramento Bee said the Newsom affair, revealed when he was San Francisco mayor, came amid a divorce. The affair was with Ruby Rippey-Tourk, married to Newsom’s campaign manager and one of his closest aides. “I can’t blame anyone for my part in this ugly episode,” Rippey-Tourk said. Newsom in February was asked about his relationship with Rippey during an onstage interview sponsored by Politico and the University of San Francisco. 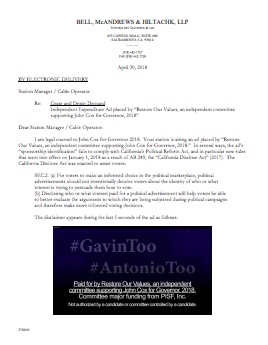 In April, an independent expenditure committee supporting businessman Cox called Restore Our Values ran a 30-second commercial that showed Harvey Weinstein, Charlie Rose, Roger Ailes and others accused of sexual misconduct. “Powerful men are finally being held to account and punished for inappropriate sexual conduct with women over whom they exercised power,” said the ad’s narrator. 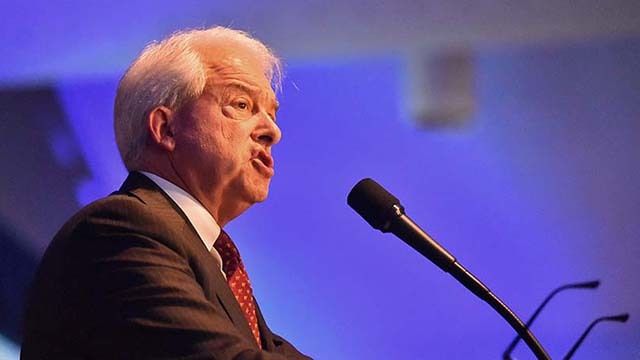 The kicker: “Californians deserve better: John Cox for governor,” said a San Francisco Chronicle report.